Upon his arrival in P.E.I. in 1813, Charles Douglass Smith, the island's newly appointed lieutenant-governor, discovered that there was a serious shortage of circulating coin. Although Spanish coins, mainly the dollars or 8-reale pieces, occasionally found their way to the island in trade, they rarely remained in circulation because they were used to pay for imported goods. In an effort to alleviate this situation, Smith issued a proclamation in 1813 stating, in part: "It is also ordered that Spanish Dollars, limited to the amount of One Thousand, shall be cut at the Treasury, by having a circular piece taken out of the centre of each - the Collars so cut, are to be issued from and received at the Treasury at the rate of Five Shillings Currency each, and the piece so taken out to be issued from and received at the Treasury, at one shilling currency each. " Thus each Spanish dollar provided two silver coins - the outer ring or 'holey dollar' and the centre disc or 'plug' - with a combined total value of six shillings. Since the unmutilated Spanish dollar was valued at only five shillings, it was hoped that by overrating the holey dollar and plugs these pieces would remain in circulation on the island. However, owing to a large number of fraudulent imitations, probably made by the local merchants, the official issue was recalled and, after 28 September 1814, even genuine issue were no longer exchangeable at the colonial Treasury. However, the unredeemed holey dollars, as well as the merchants' forgeries, continued to circulate for many years. Although records describing any official markings do not seem to have survived, the holey dollars and plugs appear to have been counterstamped with a ring consisting of ten triangles forming a kind of star or sunburst. 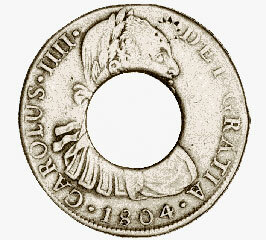 On the holey dollar this pattern can be seen overlapping the Spanish king's forehead. The coin illustrated is slightly larger than a Canadian silver dollar and is part of the National Currency Collection, Bank of Canada.